Conveniently located in Culver City, this breathtaking production studio boasts high ceilings, and a 14-foot lighting grid with full theatrical lighting features. Enjoy the high-quality QSC sound system supported by 900 amps of power and an ISO transformer. Showcase your best work on the 6500 lumen projector and electric projection screen. VIP guests and performers will be comforted in the fully loaded green rooms and will savor the walk-in refrigerators. Accompanying the venue is a huge selection of theme props, fabric drapes, and décor rentals on site. 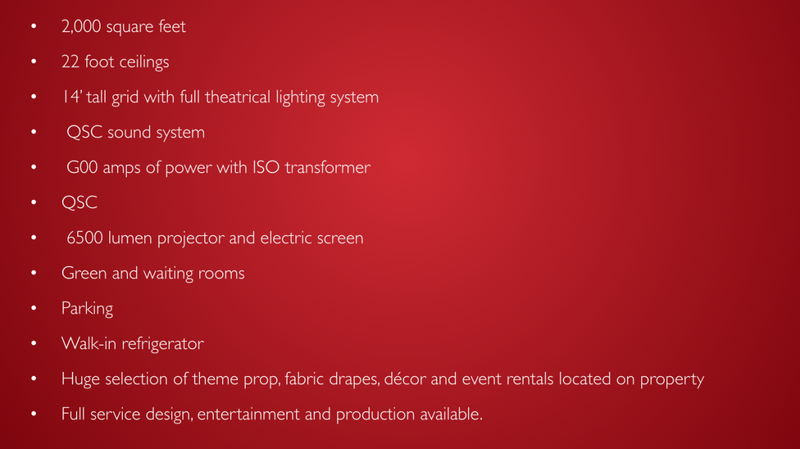 Full service design, entertainment and production assistance is also available.